BNW Commercial specialises in the sale and leasing of commercial and industrial properties. BNW Commercial is a small, but thriving, commercial and industrial real estate agency that prides itself on its hard-working, conscientious team. 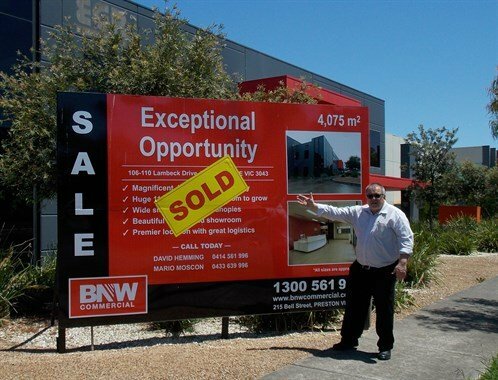 Based in the northern industrial suburb of Somerton, BNW Commercial concentrates its efforts mainly in the greater Campbellfield and Epping industrial precincts. Serviced suburbs include: Campbellfield, Somerton, Epping, Craigieburn, Thomastown, Broadmeadows, Coburg, Reservoir, Airport West, Tullamarine, Sunshine West and Laverton. We have built a strong knowledge base over the last decade or more. BNW's dedicated team is passionate about its attention to detail and the level of service it provides to its clients. We also enjoy and appreciate the high level of respect we have earned over the years from our clients and professional associates.